As we pass through the anniversary of 26/11 attacks in Mumbai, we all remember the bravery of the NSG Commandos in fighting the terrorists and bringing them down. However, what we lose in translation is the valor with which another force held the guard while the NSG was held up from being air-mailed owning to lack of a plane. These were the brave men from the Marine Commando Force, named as MARCOS or marine commandos. 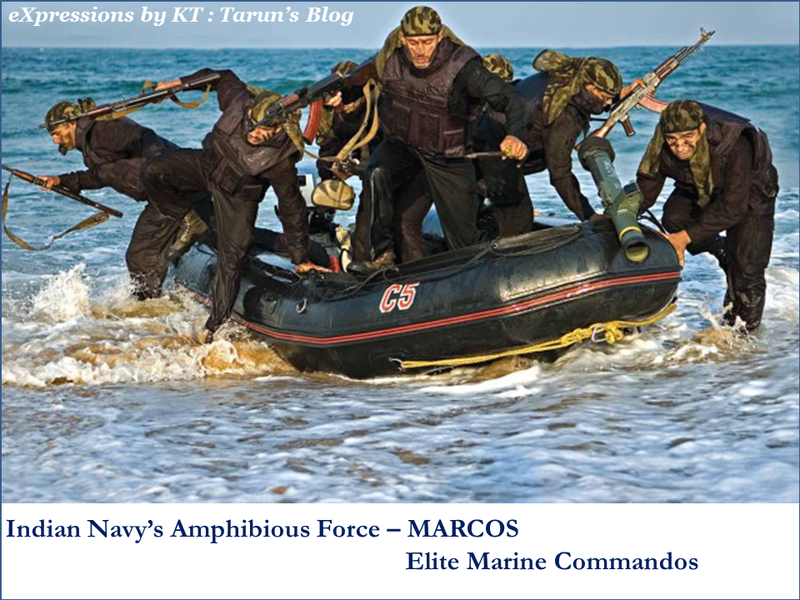 While NSG is a specialized force raised for anti-terror operations, MARCOS has a specialty in waging amphibious operations. This is a special force that was commissioned into the Indian Navy in 1987 to provide a specific capability to launch operations from any base medium – air, land, ship or submarine. Indian Navy had a special role during the 1971 war between India and Pakistan and it was during this operation that need for a specialized force was felt which could spearhead such operations from an off-shore navy base. However immediate need for such specially trained commandos was realized and approved when Indian assets in Bombay High came under terrorist attacks. Oil production platforms in the Arabian were taken over by terrorists and India found itself lacking of trained capability in launching off-shore counter attacks. Though the attacks were handled at that time, central government was prmot in granting sanction for raising an “Indian Marine Special Force (IMSF)” which gradually became which was later renamed as Marine Commando Force (MCF) in 1989. These highly trained elite force members, recognized by their maroon berets and the commando badge over their name tally, are one of the most reserved set of men who have been kept under as much wraps as possible in a nation like ours. This is to support the clandestine nature of most of their operations. Most of their operational procedures and logistical details of MARCOS are highly classified. The Marcos have gained a fearsome reputation among terrorists who refer to them as the Dadhiwali Fauj (bearded army) since Marcos are the only non-Sikh personnel allowed to grow beards, or ‘Jal Murgi’ (water hens) for the speed in which they assault from the water and even ‘Magarmachh’ (crocodiles) for their amphibious capability. MARCOS are known to be very secretive, not revealing their actual identity as specialized, elite soldiers. Some of the estimates put the present number of MARCOS at around 2000 however actual strength is of course classified. When the force got its present name in 1989, INS Abhimanyu became the parent (HQ) naval establishment for Chariot and Marine Commando operations. INS Abhimanyu is under the operational control of Flag Officer Maharashtra Area, who is responsible for the defense of Mumbai from anti-national threats. With increasing demand for such a capability and rapid response requirement in Bay of Bengal area, MARCOS east was christened 1992 with headquarters in Vishakhapatnam (Vizag). Original Mumbai based unit was named as MARCOS west. In addition, one small MARCO unit has been based at Port Blair to meet the special operation requirements in the Andaman and Nicobar Command. MARCOS comprises of specifically selected male personnel of Indian Navy from both ranks of officers and sailors. They are selected when they are young, in the early 20s and have to go through a very stringent selection process and training. MARCOS are Indian equivalent for US Seals or British SBS and are definitely capable at same standards. Many believe that these may be better capable in physical and mental training compared to the best in the world. This reputation does not come easy and a lot goes into preparing an Indian Navy sailor into a MARCOS. The selection standards are extremely high. The training is a continuous process. In initial years of its commission into Navy, the force was trained by the other special forces of the country, including those under the Home Ministry and the Army. Trainings were also acquired in cooperation with US Navy Seals and British Special Air Service. The officers receiving this training formed the first nucleus of the MCF or Indian Marine Special Force (IMSF) at that time. To keep themselves combat ready, MARCOS participate in joint exercises and training with foreign and Indian Army Special Forces. MARCOS undergo 10 weeks basic training in INS Abhimanyu followed by a three week Basic Para course at the Army’s Para Training School at Agra. They also undergo a basic Combat Divers course. The typical training regimen for a MARCOS includes: airborne operations, combat diving courses, counterterrorist, anti-hijacking, antipiracy operations, direct action, infiltration and exfiltration tactics, special reconnaissance, unconventional warfare training etc. All MARCOS personnel are freefall qualified (HALO/HAHO) and a few also qualify to operate the Cosmos CE2F/X100 2-man submarines. They are skilled combat divers and parachutists and the MCF is one of a handful of units in the world that is capable of para-dropping into the sea with full combat load and equipment. On completion of basic training, MARCOS join designated ‘Prahars’ for ‘on job’ and vertically specialized advanced training After qualifying as MARCOS, officers and sailors remain in the MARCO sub-cadre for 3 and 5 years respectively. In their operations, MARCOS are assisted by Westland WS61 Sea King transport helicopters, Chetak helicopters and 2-man submarines. MARCOS can be launched from ships, aircraft and submarines in full battle gear. MARCOS are also provided with the best of gear including weaponry and equipment. Primary assault weapon used by them is Tavor21 assault rifle and Galil sniper rifle procured from Israel. The IMI Tavor TAR-21 is a 5.56 mm advanced waterproof rifle with a firing speed of 700-900 rounds per minute and a range of over 400 meters. This is supplemented by a 9 mm semiautomatic pistol for close range combat. The gear includes a light bullet-proof Kevlar combat helmet, Kevlar bulletproof vests containing soft armor with positive buoyancy to support aquatic operations, fire retardant high technology fabric uniform and lightweight all terrain steel hardened para boots. The group-level gear requirements include command and control and surveillance systems along with high speed communication equipment. The devices would have sight for the sniper, laser range finder and long range thermal imager (medium and long range) and near IR laser pointer for a combat group to undertake surveillance, reconnaissance and targeting. MARCOS use a VHF/UHF wireless systems to stay in continuous communication with the rest of the team and command center. Overall, MCF is a very able and highly specialized unit among Indian paramilitary forces and it is imperative to keep this force combat ready and in its best shape by regular up gradation of their equipment and weapon system. A number of such forces have been marred with red-tapism and bureaucratic apathy and are losing their shine but it is crucial to ensure that MCF and other such agencies remain equipped with best and trained to perfection so that any threat to Indian assets can be responded to in time and with adequate vigor.